Summer break is here, which means no school and fun in the sun. For most of us it also means no cheerleading until football season starts back up. 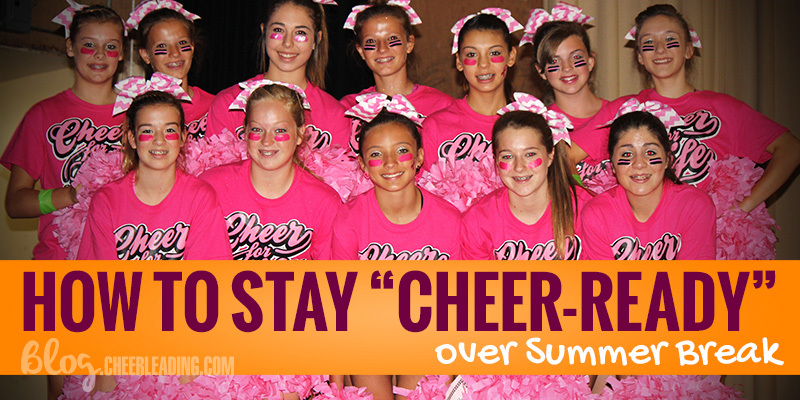 How can you stay “cheer-ready” during your summer break? You do not want to be huffing and puffing through practices when they start back up! Plan to do something active several times a week- jogging, aerobics, really anything that gets your heart rate up and will improve your endurance. Remember that those 3 hour football games are only two months away! Summer is not the time to relax on working on your jumps! Instead make it a time to advance and impress your squad and coaches. I asked my cheerleaders to do a minimum of 25 jumps on each leg, each night, and most importantly STRETCH! Work on your techniques, including motions, voice, tumbling, etc! Summer is the perfect time to improve on your skills. Join a tumbling class or see if your local gym has cheer classes available. Think about ways to help build school spirit when school starts back up! Maybe your squad should make posters or plan a welcome back pep rally? The best way to generate excitement for football season is to unite your student body. Have fun as a squad! Plan a squad sleepover, movie night, or other team-building activity. Staying connected with your squad during summer break will guarantee a stronger squad during the school year.